The daughter of prosperous Quaker parents, Moses and Mary Morris, the younger Mary Morris, born in Rugeley (Staffordshire) on 5 May 1733, was "carefully brought up in substantial and useful knowledge," according to one contemporary account. As she would demonstrate in her later life, she knew the classics well enough to cite them, she could write poetry, she could understand current scientific theories, she was familiar with botany, and she was fluent in French. She would later write that when she was young, she was sometimes regarded as a "romantic chatter-brain" by her Rugeley neighbors, a description that belies her intellect, accomplishments, and activism. Also said to be "the great beauty of Staffordshire," she would later downplay her appearance by describing herself as "a damsel of middle stature, and ruddy complexion," comparing herself to a milkmaid who is "blue" on a "frosty morning." Her sense of humor and self-deprecation were accompanied by her determination. As a young woman, she resisted her parents’ authority to arrange her marriage, declining a husband of her parents’ choice and insisting on her right to choose her own husband--which she eventually did. Her resistance, however, brought her into conflict not only with her parents but with important Quaker authorities. 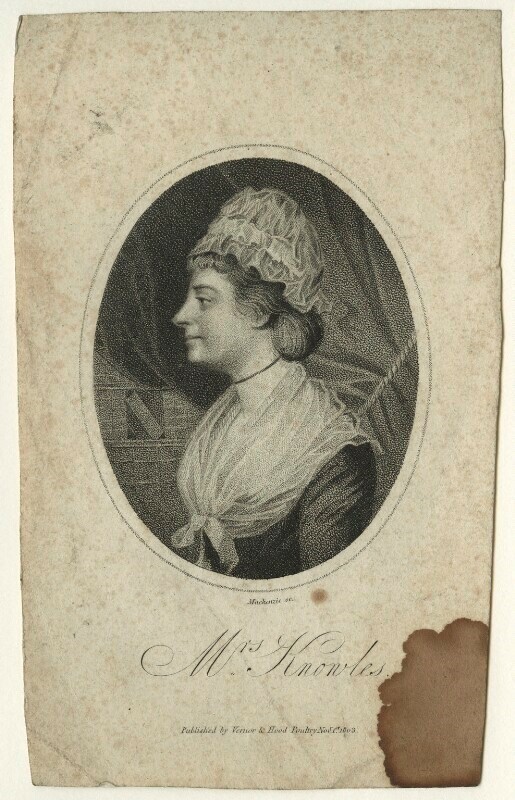 In her satirical autobiography, Memoir of M. M., Spinster of this Parish, she reiterated her view of marriage: she planned to "bestow the treasure of my inestimable Self on some lucky, happy individual, as a very proper and suitable help meet." Which is presumably what she did when she finally married in 1767, at the age of thirty-four. Her husband, Thomas Knowles, was also a Quaker, an apothecary by trade. Although she had consented to be a "proper and suitable help meet," at last, Mary Morris Knowles also made it clear that she did not intend to be "a poor passive machine . . . a mere smiling Wife." But some aspects of marriage were unavoidable for an eighteenth-century women, no matter how determined or independent. The birth of her first child in July 1768 nearly killed her--and the baby, a boy, lived only a day. She wrote movingly of her experiences in letters and in poetry. After this traumatic labor and delivery, Mary Knowles began creating embroidered pictures, her needlework an example of "needle painting," a technique "so highly finished, that it has all the softness and effect of painting." As Knowles described her art, "my employment is working in divers colours, and fine-twined woolen, and it is work of curious devices, and of exquisite cunning in the art of the needle. "She also produced "printwork"--she drew pictures onto silk or linen, then worked these images with lines of fine black silk stitches so that the finished piece looked like an engraving. By 1771, Knowles's reputation as an artist had drawn the attention of Queen Charlotte, who commissioned Knowles to produce a needle painting of a portrait of George III. Knowles's version of Johann Zoffanny's portrait of the king brought her praise and an excellent "gift" (rather than a commission) from the queen--indicating that the relationship was personal rather than professional. However the payment was regarded, it allowed Mary Knowles to fund her husband's training to become a doctor. After Thomas Knowles completed his education, the couple settled in London. He was successful in his career, while Mary Knowles developed a circle of literary and political friends and associates. At the age of forty, she also gave birth to a boy. In London, Knowles became an active supporter of the abolitionist movement. She also met a young woman named Jane Harry--the daughter of an English planter and a Jamaican woman. After she converted to Quakerism, Harry's British guardian cut ties with her, and the young woman came to live with Knowles. Knowles's argument for religious toleration--her support for Harry's decision to convert from Anglicanism to Quakerism--brought her into conflict with Samuel Johnson. James Boswell's account of their debate has, as Judith Jennings notes in her study of Knowles, had a long and negative effect on Knowles's reputation. When Thomas Knowles died in 1786, he left a considerable estate, inherited by his wife. She did not remarry. She did continue her activism, and she also continued to write. In addition to her earlier autobiography and poetry, as well as the tract entitled "Compendium of a Controversy on Water-Baptism," she collected "A Poetic Correspondence" (between herself and a Captain Morris," and produced more tracts and poems supporting her political views. While most of these were circulated in manuscript, she eventually published her account of her dispute with Samuel Johnson, "Dialogue between Dr. Johnson and Mrs. Knowles" (1791). Mary Morris Knowles died at the age of seventy-three on 3 February 1807. 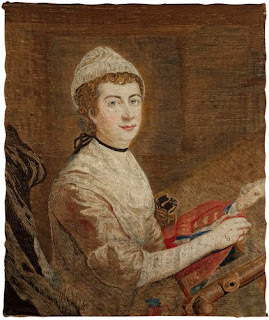 My own interest in Mary Knowles began with her needle-painting--I came across her name when I was reading about the needle-painter Mary Linwood. I had no idea about her literary and political endeavors. Interestingly, however, there seems to be nothing much written about her artwork after her completion of the painting of George III.